The Festival of Food Journalism, in Turin, offers not only interesting debates and seminars, but also original tastings of innovative products. In the splendid setting of the aperitif offered by the "Maestri del Gusto Torinesi" the latest product of the Roi company, the Taggiasco Extravirgin, was presented. 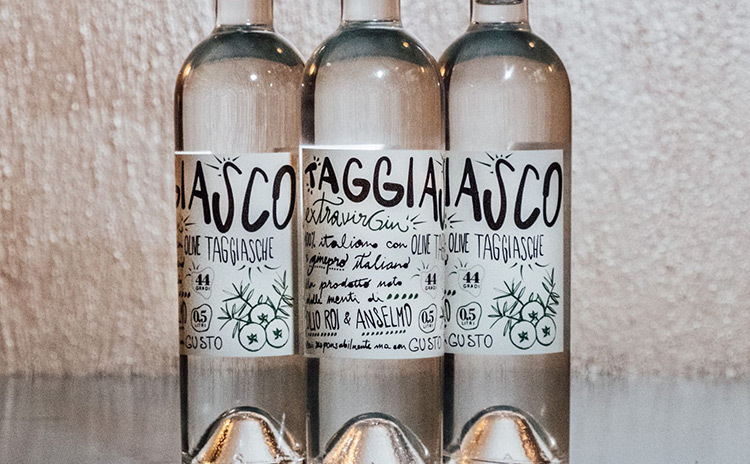 Born from an intuition of Paolo Boeri and Davide Pinto and with the contribution of Justin Ballato, expert on plants and herbs, and in collaboration with a historic distillery in Turin, Taggiasco ExtravirGin is the first gin produced with Taggiasche olives. The new product, which is part of the innovative and creative trend that has characterized the company of the valley of Argentina since some years, has been a pleasant discovery for over 150 journalists accredited to the tasting, allowing to discover the aromas and flavors of the Valle Argentina, where the ROI mill (the historical nickname of the Boeri family) is located, combined with the bitter notes of the juniper berries of the Susa valley. Two typical ingredients of particular and fascinating territories, whose collection is not easy and requires effort. The Taggiasco Extravirgin, which ideally combines the two regions, is a new product that is not only addressed to the barmen, who on this occasion have proposed it with interesting variations and combinations, delicious with the Vermouth Anselmo, but also those looking for a product 100% Italian to be tasted in purity, thus discovering its most intimate and delicate nuances. The purchase can be done directly online on the site of Olio Roi, is also in a lively Facebook page and is on Instagram @taggiascoextravirgin.